Calls for reform in economics have intensified significantly in recent years. The financial crisis highlighted the risks of relying on a narrow set of neoclassical economic models and amplified demands for a more diverse approach to teaching and research in the field. Growing challenges to sustainable prosperity add further urgency to the need to shift. Rising inequality and environmental threats are cases in point. The need for change is further amplified by the economic story that shapes our lives. In the words of F. S. Michaels “In these early decades of the twenty-first century, the master story is economic: economic beliefs, values and assumptions are shaping how we think, feel and act”. 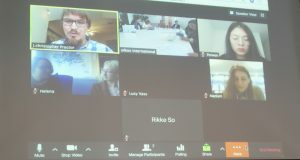 On 28th March 2019, oikos organized a roundtable to engage key stakeholders in a discussion about the future of economics curricula. We provided a space for students, faculty and practitioners who have a stake in the future of economics to come together, share experiences and opinions and develop a plan for a coherent way forward. 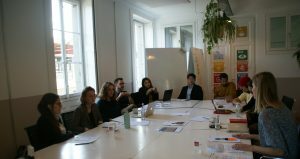 The roundtable at the ImpactHub Geneva welcomed representatives of the University of Geneva, Rethinking Economics Geneva, Rethinking Economics Switzerland, Green Growth Knowledge Platform, World Trade Institute and UNITAR. Local oikos chapters from St.Gallen, Lille and Copenhagen and former oikos Associate in Pluralist Economics also joined online. The roundtable was facilitated by Johannes Schwarzer from the Council on Economic Policies. The representatives discussed their projects that focus on educational innovation, talked about their success stories, challenges and tried to carve out strategies for reforming the education system. According to oikos President Clementine Robert: “Climate change is not profoundly discussed in the textbooks from the 1950s (including their re-editions) that are continuously being used. Our goal should be not only to develop electives that address global sustainability challenges but bring this discourse into the core curriculum”. The roundtable discussion made it clear that student groups and advocates for curriculum reform can justify the need for change and are able to share some promising practices happening at universities. For example, oikos Lille explained that they worked closely with Director of MSc in Global Business, Bastiaan Van Der Linden to exchange ideas on how to integrate sustainability into the curriculum. They joined a brainstorming session on how to teach climate change at business schools and participated in identifying sustainable companies for student visits. Next year the program will open its doors for the first cohort of students. In 2017, oikos welcomed J. Christopher Proctor as an associate in Pluralist Economics. He developed a workshop on Pluralist Economics and traveled across Europe and the USA to diversify the economic toolkit of oikos members. J. Christopher also wrote two reports. “oikos Guide to Pluralist Economics” introduces readers to different schools of economic thought, while “Mapping Pluralist Research” provides an overview of the research which has come out of the student movement for pluralism in economics. Online open source platforms like Exploring Economics and Heterodox Economics enable students to gain insight into a multitude of resources that explain how the economy works. Universities too are taking action. For example, Nottingham University Business School has been at the forefront of education for sustainability. They have organized #ResponsibleNUBS initiative to raise awareness of the Sustainable Development Goals (SDGs) around the School and build student and staff capacity to action the SDGs. On a global level, the Teach SDGs online platform offers open and accessible resources, lessons plans, and global projects directly aligned to the Sustainable Development Goals. The question that hijacked the second part of the roundtable was, HOW we can bring about the major change on a global level and how to convince key stakeholders to jump on the pluralist and sustainability bandwagon. Participants, therefore, tried to identify the main strategies necessary for accomplishing such a goal. Student groups operate on local and international levels. Local groups advocate for the change directly at their universities. For them, the crucial point is mapping different issues in terms of sustainability and monolithic economics education, as well as identifying main barriers and challenges preventing them from taking action. On the other side, the knowledge of promising initiatives and inspiring practices is crucial to show the way forward. Having a solid understanding of the main problems and possible solutions makes conversations with key stakeholders such as faculty, administration, business, civil society and government easier and more convincing. These groups need to capitalize on the stakeholders’ strengths and help improve their weaknesses to leverage the impact. The language we use influences how people perceive and behave with us, so it is important to approach potential partners with respect to their expertise and do not think of them as villains. At the same time, the students can talk to open-minded faculties who are willing to think differently. Such a strategy was instrumental for success at oikos Lille. Students do also act on their own. They run campaigns at universities, conduct surveys to learn what students wish to be taught and promote inspirational curricula. For instance, a survey conducted by local Rethinking Economics group in Geneva proved that around 500 students were interested in having a pluralist economics curriculum that would address pressing global issues. 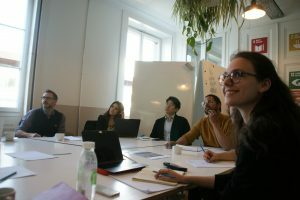 oikos Copenhagen is currently undertaking a project called “Curricular Transformation”, that includes interviewing students, professors, and companies to learn about shortcomings and strengths of existing study programs and acting upon the information to innovate the curriculum. International student networks maintain the flow of information between local groups. The types of information they share include everything from new lessons learned to prototypes of curricula and main pitfalls. They ensure the exchange of knowledge across countries, universities as well as generations of students and help them move forward to the goal. Furthermore, to overcome issues associated with the lack of funding that often hinder students from realizing their projects, different student networks can join efforts to develop proposals for public or private foundations at the national and international levels. Looking back at student experiences, J. Christopher reflected “To create something new sometimes seems easier, than to change what already exists. Our hope in the theory of change is that from creating something new constantly, we will eventually shape existing understanding and ways of teaching economics”. What lies ahead for students and faculty keen to address the shortcomings of orthodox economics? The world (at least a growing part of it) seems to have woken up, and the momentum is here for everyone who wants the change to garner together and advocate for reforming economics education. On behalf of oikos, we are determined to take these actions further and facilitate the multistakeholder conversation. One of the next opportunities to continue comes on November 1 and 2 with the oikos FutureLab, an international conference, focused on developing economics and management education that meets global sustainability challenges. The University of Geneva offers programs with a focus on sustainability and Sustainable Development Goals and has been working on the integration of SDGs in overall university curricula. Rethinking Economics Switzerland is the Swiss national network of Rethinking Economics established to reform the economics curriculum at universities worldwide. Green Growth Knowledge Platform is a global network of international organizations and experts that identifies and addresses major knowledge gaps in green growth theory and practice. World Trade Institute is a leading academic institution working on teaching and research that address issues of international trade and investment regulation and economic globalisation and sustainability. Operating at the University of Bern, they study the interconnections between the fields of law, economics and political science. UNITAR is a training arm of the United Nations that offers different learning events including conferences, public lectures, online courses and many more. Recently, they have contributed the the UNESCO report “Education for Sustainable Development: Learning to Act, Learning to Achieve”. Council on Economic Policies is an international nonprofit, nonpartisan economic policy think tank for sustainability focused on fiscal, monetary and trade policy.